Former Deep Purple keyboardist Jon Lord has received the Honorary Degree of Doctor of Music from the University of Leicester. 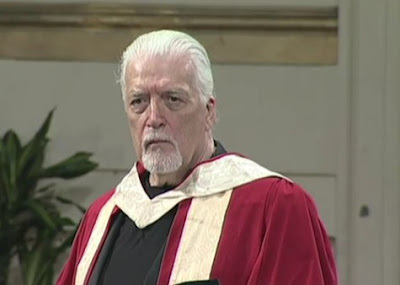 These words rounded off a detailed account of Jon Lord’s musical life that preceded Jon being presented with the Honorary Degree on July 15 at the University’s De Montfort Hall. - "It is humbling to hear your life retold with such accuracy," he said in his acceptance speech, where he also spoke fondly of his musical childhood in Leicester. His first concert was experience was in the same hall where the presentation ceremony was being held. - "I was 6 or 7 years old and heard cutting edge classical stuff performed by the Hallé Orchestra; the William Tell Overture, Grieg’s Piano Concerto and the New World Symphony." - "It thrilled me and possibly changed things right there," he explains. Years later in the same hall, he saw Buddy Holly. - "He spun my head around. The love of what Buddy Holly represented and the love of what the Hallé Orchestra represented has defined my musical life." - "This town was and still is deep inside my bones, and it’s a huge, huge privilege and an honour to come back here and accept this honorary degree. My parents – were they alive – would be dancing in the street. I suspect and hope they’re dancing somewhere far more pleasant than Averill Road [Jon's childhood home]. Thank you and God bless!" The last time Jon Lord visited the University of Leicester was 41 years ago when Deep Purple played at the Students’ Union on February 7, 1970.